Holy cow, this little cutie is already 3 months old! I feel like 3 months is when things start getting really fun. Not saying they haven't been fun because Grayson has been such an easy baby thus far, but you know. This age up until 9 months old are honestly my favorite because they are so smiley and cuddly, but ARE NOT mobile yet. Did you hear me? Not mobile yet! I just love it. Weight: We don't have an appointment until his 4 month, but we did take him in the other week (for just a cold) so we think baby boy is close to 14 pounds by now. Eyes: They are still blue, but look like they might be changing to brown just like Camden's did. I'm kind of hoping they will stay blue, but I'm not counting on it! 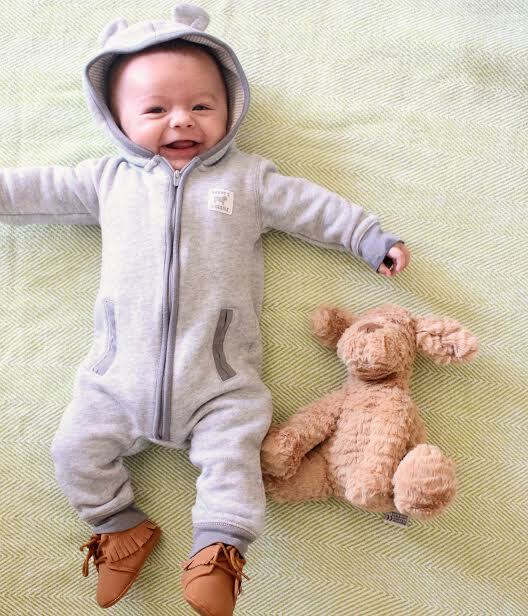 Clothes: 3-6 months, and already in 6 month sleepers! Sleeping: We transitioned him to his crib around 10 weeks old and he has been sleeping so much better ever since. He takes 3 1.5-2 hour naps and 1 shorter evening nap per day, and at night he goes to bed at 830 and sleeps until 630 or 7am! No more middle of the night feeds...YAY! Also, he spoils us because we can just swaddle him and lay him in his crib for nap/bedtime and he falls asleep on his own. We will give him his pacifier but normally he just spits it out within 30 seconds and then ends up falling asleep. On one hand it's SO nice that we don't have to rock him like crazy and that he doesn't take forever to fall asleep, but on the other hand sometimes I just want to cuddle him. I will often sneak in his room just to hold him for a bit when I miss him. Milestones: He just started last week rolling from his belly to his back, and the first time he did he decided to be an over-achiever and repeat it another 2 times! He has started laughing, especially when we tickle him. When he smiles and laughs his face kinda scrunches up and I just love it. I can't wait for the next few months to see him and Camden's relationship grow. Camden is still very much obsessed with him...he wants to lay RIGHT ON HIM to cuddle and just loves being around him. The days that Camden is at school, I will bring Grayson in with me to Camden's classroom when picking him up for the day and he runs right over to Grayson and beams with pride that he is his brother and there to see him. Sometimes all the other kids will come up to see "the baby" and Camden just gets this huge smile/smirk on his face...kinda like, "yeah, that's MY brother!" It is the cutest. Excited to see what these next few months have in store, and of course for the holidays with this cuddly bear. Happy 3 months, Grayson, we love you sweet boy! PS: I have a post coming up soon sharing a really exciting collaboration I'm doing, so stay tuned!